I’m constantly looking back over my shoulder, both literally and figuratively. Did I remember to turn off the oven? Should I have said what I said, done what I did? Is my dad still standing there in the freezing cold at the end of the sidewalk waving to me as I drive away? Nowhere is this tendency to look back more pronounced than when I write. I revisit and revise things I’ve written over and over again, sometimes even decades after I first wrote them. For this reason, trying to keep up a blog has been a sometimes painful form of self-discipline. Because the time I have to write is so limited, it’s only a self-imposed posting schedule that keeps me going. But forcing myself to write and actually post to a deadline has been a bit like what I would imagine it would feel like to have to run naked around my neighborhood. (If you happen to have read “Naked” you’ll know how unthinkably horrific that would be for me, not to mention for my neighbors as well)! I could so easily be paralyzed (turn into a pillar of salt?) by succumbing to my urge to endlessly look back, fix, tweak, and edit. This is perhaps why the literary theme of looking back as an act fraught with peril resonates with me. A couple weeks ago I explored this theme in “Looking back,” a poem written from the point of view of Lot’s wife, who turns to watch Sodom burning. This week’s “Looking back” poem is about Orpheus and Eurydice. On their wedding day, Eurydice is killed by the bite of a venomous serpent and is taken into the Underworld. So powerful is Orpheus’ music that he is able to sing his way into the Underworld and is even able to persuade Hades to allow Eurydice to return to Earth. In most versions of the myth, in his frantic joy at finally reaching Earth with his beloved, Orpheus turns too soon before Eurydice has been able to cross the threshold of the Underworld. For this one glance, Eurydice is lost to him forever. Gluck’s operatic version of the story is even more cruel. Eurydice cannot understand why Orpheus won’t turn to look at her. She reproaches him for no longer loving her and refuses to continue on with him. Unable to bear her grief, Orpheus turns to reassure her of his love and she is lost to him again. Of course Orfeo would turn to look at the pleading Euridice – how could he not? Because, while “no one in his senses” would do so, he is quite out of his senses with love and grief and hope. You lose the world for a glance? Of course you do. That is what the world is for: to lose under the right circumstances. And to know this terrible nightmare is over! Too soon! For this glance, Eurydice is lost forever. I’m quite sure I’ll be looking back and changing this poem, but there it is for now. 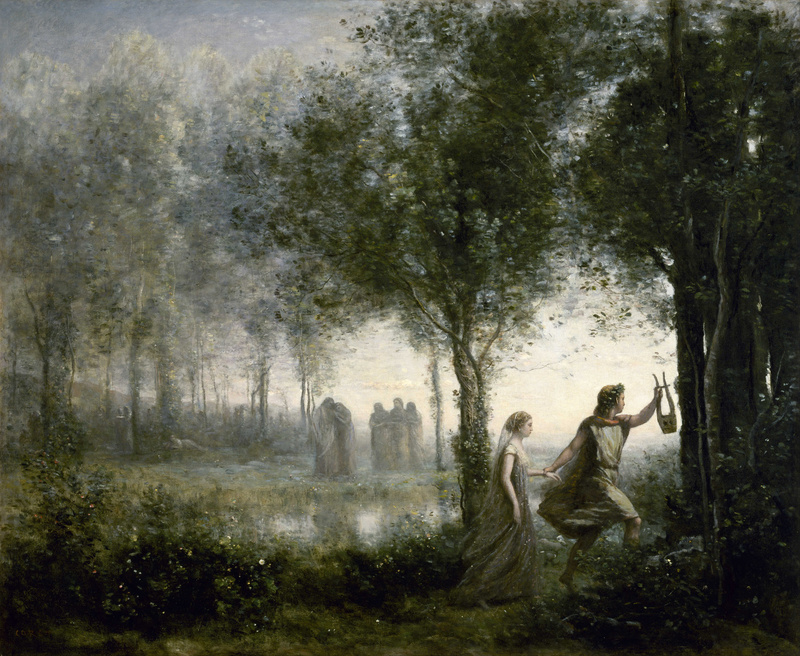 owonderful • This entry was posted in Art, Poetry and tagged blogging, Christoph Willibald Gluck, Jean-Baptiste-Camille Corot, Orfeo ed Euridice, Orpheus and Eurydice, poetry. Bookmark the permalink.